I was very happy with my AK Handguard; the stock one that comes from arsenal. I put a piece of heat tape on the aluminum heat shield on the inside and it has been rock solid and for the most part stays cool. The ultimak on the other hand is a nuclear inferno after a few mags. I have solved that with a sandwich of heat tape with an outer shell of 3m grip tape. This works really well for the times when your hand sneaks up a bit onto the ultimak’s edges. When Magpul decided to put out a line of AK Handguard and stocks I had a feeling they would do it right. There are some AK shooters over there that in my mind understand both the limitations and the advantages of the AK. I think their end goal is to minimize the limitations and maximize the AK’s strengths. I have been burned (literally) in the past by AK handguards by manufactures that didn’t get the limitations. 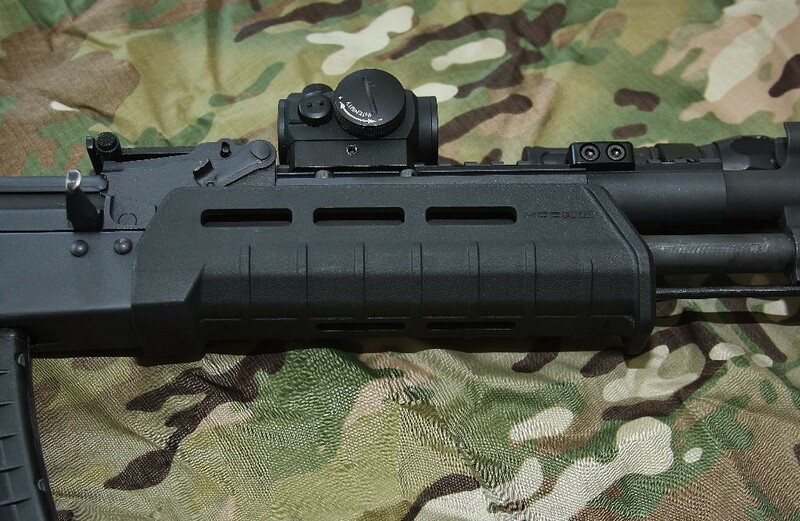 The TWS Handguard is a perfect example of great idea but a botched (at best) execution. It is expensive, proprietary, and loved to trap heat. Heat is at the end of the day one of the biggest problems with AK handguards. They get hot and most shooters choose to wear gloves. I don’t mind wearing gloves but if you think you’re going to have to grad your rifle in the middle of the night are you then going to pause and put on your gloves? Let’s start off by saying Magpul killed it on the heat problem. Just as a random test we did 5 mag dumps (150 rounds) and Magpul’s MOE AK Handguard was warm at best, the rest of the rifle was nuclear hot but the handguard was not an issue. They do this with a full lined heat shield. I was blown away. #2 on how Magpul killed it with this handguard, is the upper portion of the handguard goes up and over the sides of the ultimak!! This is a HUGE advantage and your hand wont accidently slip up onto the ultimak and get toasted. If you were not running an ultimak, the handguard comes with a top cover that fits onto your gas tube and locks into the lower handguard. The Handguard is very robust polymer even more so than the MOE AR handguards that Magpul is so well known for. 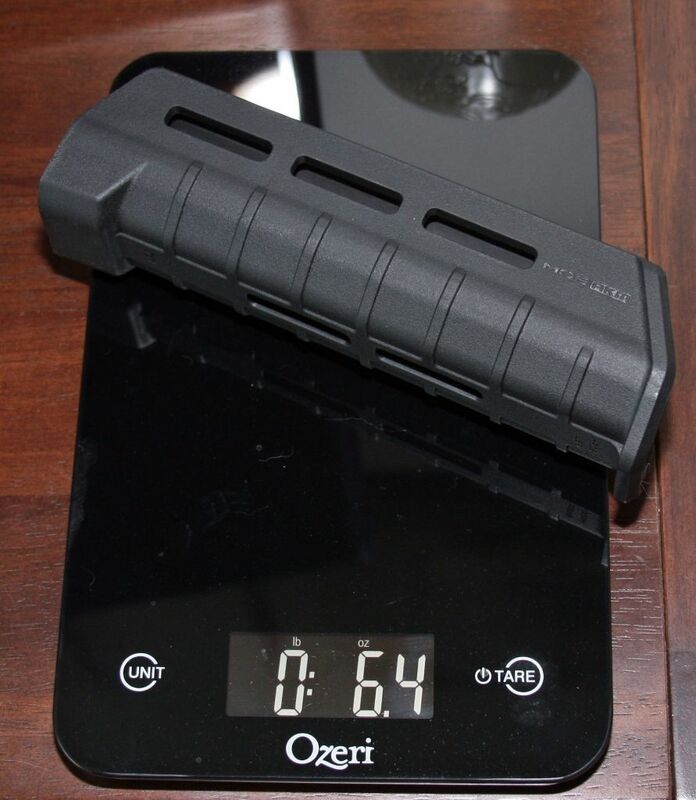 That being said the thick polymer and full lined heat shield adds about 1.5 oz to your traditional AK polymer handguards. The handguard is also thicker in the hand than the stock AK polymer handguards. If you have ever held an AR with the older MOE (not the SL) handguards it is reminiscent of that filling of the hand feeling. It is noticeable but at the end of the day, it doesn’t really bother me and over time it may less so. I think as we move into the realm of slim M-LOK and Keymod handguards these thick handguards feel dated, that’s just my opinion and I am sure a lot will disagree. I do think it’s a good trade off though, with the heat mitigation and having it wide enough to fit over the ultimak. Just something to be aware of – it will feel different in your hand vs the stock AK handguards. Speaking of M-LOK & Keymod; the MOE AKM comes with built in M-LOK slots for attaching anything your heart desires. I am a big fan of Keymod but there are limitations with polymer and having a more universal mounting systems compared to the old MOE systems is a leap in usefulness. I also have one of the new MOE SL AR handguards and the execution of the M-LOK is lacking. 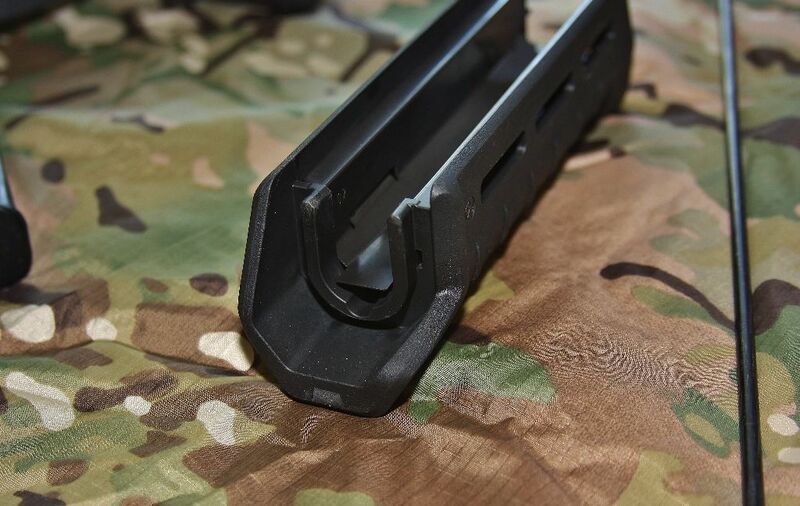 There is “bulge” at the front of the handguard that goes “around” your FSB in order to clear the front hand guard retainer and keep the appropriate required wall thickness. Because if this the M-LOK slots are too far back to use the new real estate that the SL offers. The M-LOK on the AKM handguard is nicely executed with the slots coming up very close to the FGB. If I was not running an ultimak that would make mounting a weapon light super easy and right where you would want it. The M-LOK slots also add the ability to have a sling mount closer to the receiver out of the way of your support hand. This is how I run my AR and makes transitioning to the AK less of a change and the Magpul M-LOK QD Sling Mount is excellent. The MOE AK which is a replacement for standard AK pattern rifles without a front sling loop. The MOE AKM which is what I am running, which is a replacement for original stamped receiver AK-47/AKM/AK-74 pattern rifles with a front sling loop on the hand guard retainer. And the big boy Zhukov, which is a longer version of the MOE AK. You will have to cut off your sling loop and handguard retainer as it interferes with the mounting system. This is a great idea and one a few years ago I would have been all over it. Two things that lead me not to go this route is one its heavy at 15 oz. that’s almost a full pound added to an already heavy rifle. And two, you have to cut off your handguard retainer which I fingered I learned my lesson with the TWS handguard. All the handguards are available in Black, FDE, OD, Gray, and Russian Plumb. As I mentioned above, Magpul killed it on this. 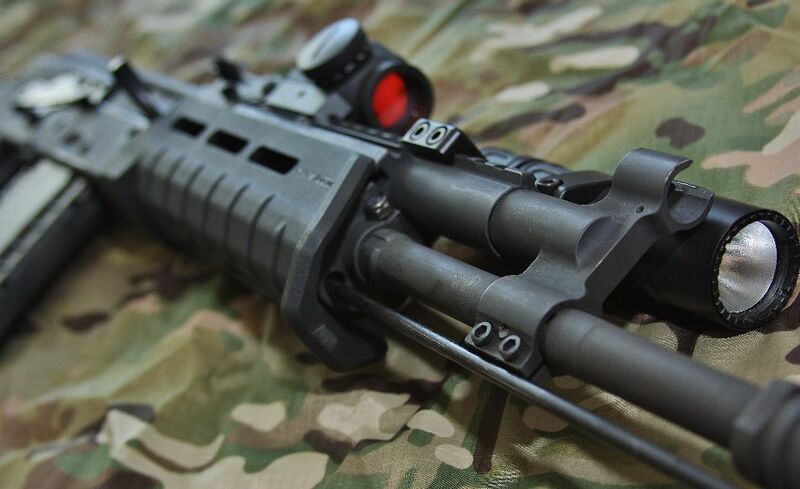 They took their time and came up with an awesome replacement to the stock AK handguard. One that is better in every way. 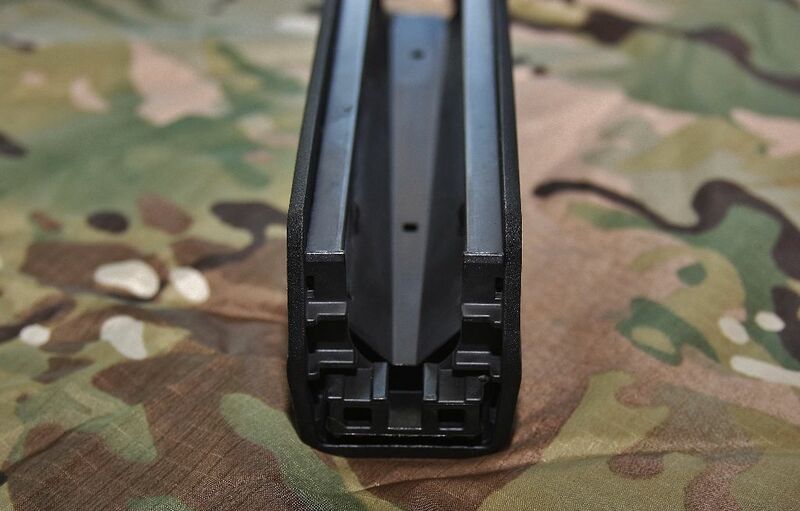 If you are one of the AK lovers that would never put anything modern on your AK this is clearly not the handguard for you and I would have no idea why you are reading this blog in the first place. 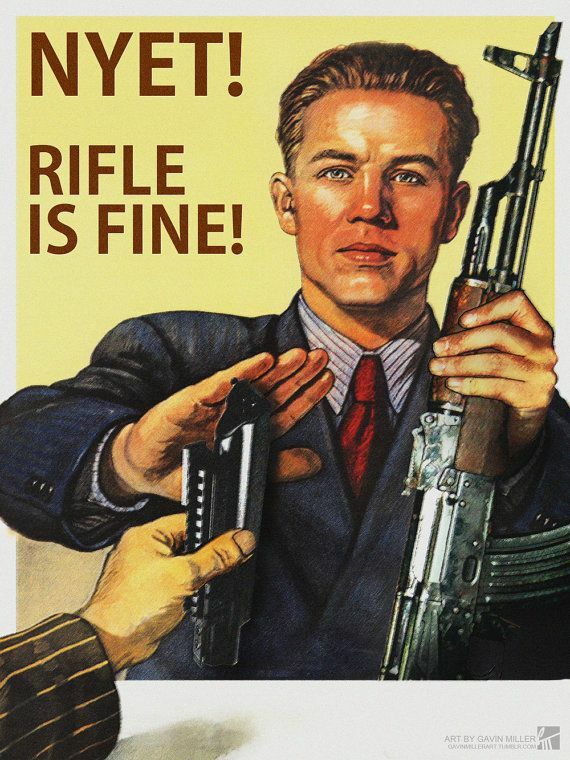 I see guns as tools and the AK is a hell of a tool. I have no idea why you would not want to make a tool more functional. In my mind a weapon light is a must for any rifle that will be used as a defensive weapon and preferably a red dot. If you are looking for an AK handguard that doesn’t get nuclear hot, has a myriad of attachments points and accessories which will only grow as M-LOK becomes more popular, and is probably more rugged than the stock AK handguards, Magpul’s new line of AK handguards is for you and definitely worth taking a look. I recently purchased this handguard for my Chinese NHM-90. I love it except for one oversight in the design. The lip on the bottom front and small rise on the bottom rear limit the size of the M Lok rail segment which can be used on the bottom of the handguard. I want to run an angled foregrip and laser, but the foregrip takes up the whole rail and can’t be mounted as far back as I’d like. I will probably fabricate a small “riser” to clear the lip and mount a longer rail. Other than that, it’s a great upgrade to the stock handguard. I could see that as an issue. 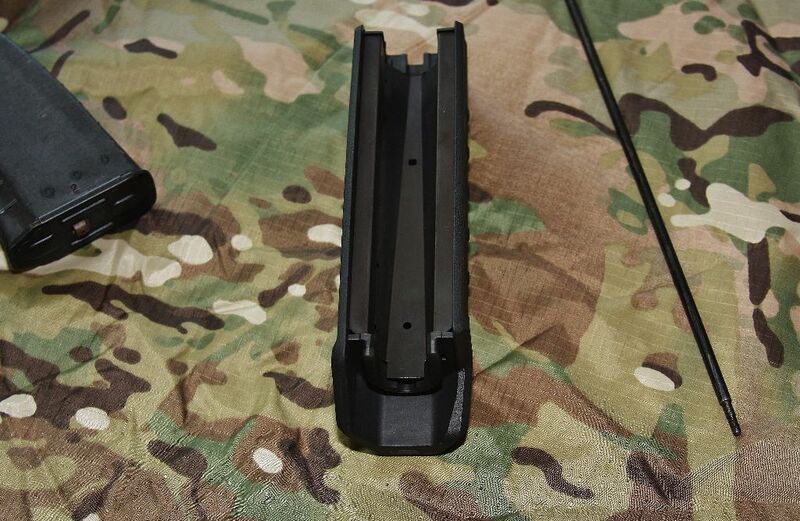 We have seen other little issues like that with Magpul’s new MOE handguards. You could just dremel off the lip, but your idea of the riser is a more elegant solution. Thanks for sharing your views about AK handguards, it has the great operating mechanism and has the barrel which also increases precision.